I've been married almost 14 years and I still have not scrapped any of our wedding. I think about two weeks ago I was playing with K&Co. Black and Ivory paper collection and thought it would make for a beautiful wedding album. So finally after all this time I'm gonna scrap my wedding. I wanted to make a video and did last night, but it just wasn't meant to be. I couldn't think while I was taping. It was really bad. 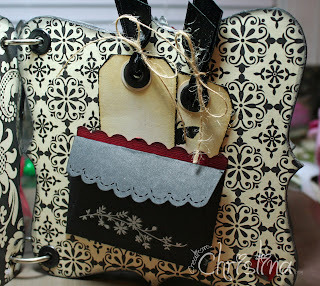 I used the "top note" chipboard shape album from Michael's. You can find them on the dollar section. 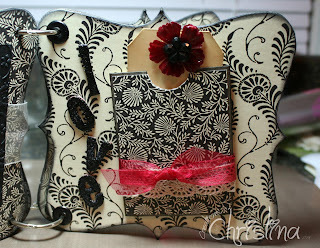 The last picture is a Tim Holtz grunge flower that I made using Accent Essentials Cricut Cartridge. The album is beautiful! Good for you for getting that done! I tend to never go back and pick up old albums that I meant to do. Very bad habit! Beautiful! I have seen a lot of TH flowers going around...looks like might be the "in" thing....I will need to try. This is just stunning! Love it and those flowers are wonderful!!! Christina you have made a very lovely album for you wedding pictures. I love the color combo and that rose is awesome. Beautiful album!! How did you make that flower it's gorgeous!! It's beautifull Christina !! I love it. WOW WOW WOW!!! just BEAUTIFUL!!! LOVIN' the grunge flower!!! Super cute job Christina....love it! How did you make that flower ? maybe on my 20th!LOL I do love your album though...it's soooo pretty and elegant looking.TFS! You have made a beautiful album,I love it. Beautiful! Your album is very elegant looking. Missed the video but the pictures are good too. Why won't you share a picture or two of the wedding? Would love to see what a beautiful bride you were. I'm all about black and ivory, black and white, and then a splash of color. Very lovely and of course we want to see you demo that grundge flower. I LOVE it Christina!! I really need to do something like this also!! I never scrapbooked any pictures from my wedding which was 13 years ago! Thanks for the inspiration! Beautiful album. Would love to see a video of the grunge flower and how to make it. Thanks for sharing. Beautiful album. I've been married 22 yrs. next month and haven't started scrapping our wedding either. In my defense, I've only been scrapping for about 5 years and have a 19 & 17 yo to catch up on. LOL! Love the Grunge flower. Maybe you could do a video on making them. I have some Grunge paper, but haven't done anything with it yet. I love everything you do and this album is stunning. 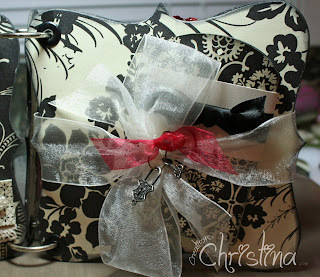 Please can you show us how you used grunge paper with that cart .... I want to have a go! Perhaps you were just waiting for the right paper to be made : ). I've been married almost 27 years and still haven't scrapped our wedding. Love your album! Wish you would show us how you made the flower. I am using the same color theme for my daughter's wedding pictures, only using DCWV La Creme papers. You've given me a few more ideas. Thanks for sharing. Very Nice Wedding Album!! I was lucky I got married 2 years ago and My Very thoughtful Niece Tiffany, made a scrapbook of my wedding for me! All I had to do is put in my wedding pictures!! Ilove your color choices,and the TH flower is awesome. The only thing missing re your pictures. We want to see it all. Love your wedding album. Just one question, how do you cover the chipboard shape? Do you trace it and then cut paper? Have always wanted to try these but nevere figured out how to cut the paper to fit the shape. Please do a video on how to make the TH flower. Your album gave me so many new ideas to try. Your videos are excellent and easy to follow. Thanks for all your work you do for all of us. Very beautiful. Would love to know how to make the flower. Wow how beautiful!! I love your color selection as well as your embellishments so elegant! So happy you got a chance to create a wedding album after so many years. OHHHHH AHHHHH the black and ivory are beautiful together. Thanks for sharing the album ideas with us. You do such beautiful work Christina. I think you might have inspired me to get out my photos as well and start scrapping them. This album came out great. Did you put you wedding pictures in it? Hi Everyone, Thought I would answer a few questions.....since my wedding was before we had a digital camera, I don't have copies to put in my mini:( So I'm waiting for my darling DH to take them to work and scan them. This way I can have them printed in the sizes that will fit my album. I will do a video on how I cover the mini albums that I purchase so you can see how I do that. For the grunge flower I will make a video if you all wish, but here is the one I used to help me. http://www.youtube.com/watch?v=2RQ2ghdws3w If you still would like me to make a video. Email me and I will certainly make one. Love the mini album! I always love looking at every ones ideas, it gets my creativity going again. Love your work. Thank you for sharing that with us! 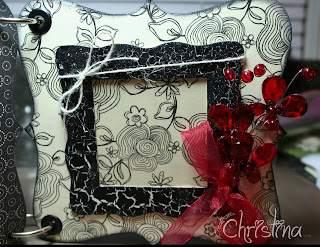 Beautiful album and I LOVE the flower...for us challenged crafters would you think about doing a video on the flower? This is beautiful. 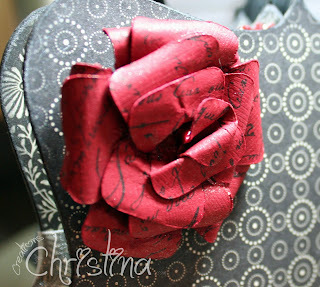 Love the grunge flower! Your new blog look is great. This is absolutely beautiful! You did such a great job. Good for you and thanks for sharing. I love this album-I want that paper pack. You did an outstanding job on it!